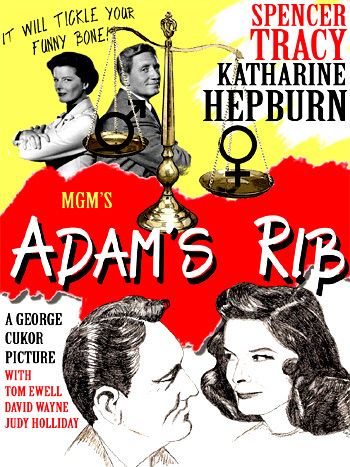 Adam's Rib (1949) is director George Cukor's most famous film of the battle of the sexes - between two married lawyers. The Oscar-nominated screenplay (originally titled Man and Wife) for the sparkling, MGM classic (screwball) comedy of the post-war years was way ahead of its time. It was written by the husband-wife team of Ruth Gordon and Garson Kanin (the recipients of the film's sole Academy Award nomination). The story was inspired by the real-world legal case of a husband-lawyer team (William and Dorothy Whitney), who after the divorce proceedings for actors Raymond Massey and Adrianne Allen, divorced - and married their respective clients. In the film, the case centered around the accused - a dumb blonde (Holliday), who shot (but didn't fatally wound) her adulterous husband (Ewell) with a mistress. The lawyers argued about the double-standard that disallowed a woman from seeking revenge with a pistol - like a man. Cukor had previously directed Hepburn in A Bill of Divorcement (1932) (in her screen debut), and in her comeback film The Philadelphia Story (1940). He had also directed the Kanin's first screenplay two years earlier for A Double Life (1947) starring Ronald Colman. This sometimes stagy film - with long, uninterrupted scenes, an immobile camera, and absurd and improbable situations, also featured witty dialogue exchanges and skillful acting. With her scene-stealing performance as a bimbo, the film boosted Judy Holliday, who was playing the lead role in Garson Kanin's Broadway hit play Born Yesterday, to repeat her stage role in the 1950 film of the same title. (For Holliday, it was a star-making and Best Actress Oscar winning role.) Tom Ewell, Jean Hagen, and David Wayne, other character stars, launched their careers with this film. The same writing, acting and directing team for Adam's Rib went on to make another screwball comedy - Pat and Mike (1952). The film's credits are presented on top of a cartoonish proscenium. Throughout the film, placards are brought down over the proscenium to announce continuity breaks, such as "That Evening." The film opens with a sequence of the commitment of the crime that serves as the centerpiece of the plot: a woman follows her philandering, wayward husband to the home of his mistress. After an overhead shot of a downtown New York street scene at 5 pm, the camera dollies down to the street level of the busy office/business district at the close of work. From a low-angled shot, the camera spies an apprehensive, sweet-faced woman with a wide-brimmed, tinsel-decorated hat (later identified as Doris Attinger - Judy Holliday in her star-making film debut after only bit parts), pacing back and forth in a small park chewing on a chocolate nut candy bar and nervously looking at her watch. She pauses in front of an office building where Warren Attinger (Tom Ewell) emerges in the midst of rushing office-workers leaving for home. He stops on the steps of the building and straightens his tie. She masks herself and ducks behind a news-stand as he stops to buy a paper. She follows him - they both proceed down subway station steps, along with jam-packed throngs of other pedestrians. At the turnstiles, Warren whistles at a pretty woman passing by. The anxious woman trails behind and when brushed by another man, she accidentally drops her purse - in close-up, the partially-opened purse contains a pistol. Looking harried, she quickly picks it up from the floor before anyone notices, is swept along toward the subway cars and squeezed into one of the departing trains. The door shuts and she presses her face against the door's window. The camera tracks Warren as he exits the subway station at street level (West 72nd Street) - Doris reappears as she emerges from an entry-way where he has passed by. Non-chalantly, he whistles as he crosses a street - she hides behind a parked car and hustles behind him as he enters a residential apartment building. He is buzzed in after ringing the doorbell - she catches the door before it locks. In the dark, interior corridor outside an apartment where sleazy, honky-tonk music is heard playing, she fumbles within her purse and takes out her deadly pistol. Bewildered, she also removes an instruction manual for the gun and discovers how to release the safety catch. Then, she points the pistol in her right hand toward the lock on the apartment door and fires once. She kicks open the shattered door and finds Warren sitting on a couch embracing negligee-clad mistress Beryl Caighn (Jean Hagen) nestled on his lap. They jump up in terror when confronted by the gun-wielding woman. She points the gun at Warren, confronting him with her eyes closed: "Shut up, you, Shut up! My dear husband." As she fires aimlessly, her husband withdraws into a corner of the room: "D-D-Doris, please-please-oh, don't, don't Doris, don't." Hiding behind a drape, he cringes, grabs his winged shoulder when hit by a stray bullet, and falls against the couch. By the mantle, Beryl screams as he crumbles to the floor behind the couch: "Help! Help! Help! Help! Murder! Help!" As Beryl runs for help, Doris becomes hysterical by the reality of her actions against her wayward husband and sobs uncontrollably. Distraught, she falls to her knees next to her wounded, but conscious husband and protectively hugs him. Amanda excitedly scans the paper's story about a woman shooting her philandering husband, and they immediately take different stands on the issue: "He was playing her fast and loose so she caught him out and popped him a few thirty-two calibers...Serves him right, the little two-timer." Strictly a law-and-order believer, Adam disparages her encouraging attitude about such assaults: "I don't approve of people rushing around carrying loaded revolvers...Is that what they taught you at Yale Law School? (She laughs.) It's not funny. Contempt for the law, you know, is the first thing..." A knock at the door reminds them that they must hurry to leave for work. Even the maid glances at the photo and headline and approvingly mutters: "Atta girl!" Amanda: Well, get by - big pig! Amanda: He hogs the whole road. Amanda: Look! All I'm trying to say is that there are lots of things that a man can do and in society's eyes, it's all hunky-dory. A woman does the same thing - the same, mind you, and she's an outcast. Amanda: No. Now I'm not blaming you personally, Adam, because this is so. Adam: Well, that's awfully large of you. Amanda: No, no, it's not your fault. All I'm saying is, why let this deplorable system seep into our courts of law, where women are supposed to be equal? Amanda: We don't want advantages! And we don't want prejudices! Adam: Oh, you're giving me the Bryn Mawr right too. Amanda: She didn't knock him off. He's alive. She didn't kill him. Amanda: No, I don't...[after an arbitrary cut in their conversation] the kind of thing burns my goat! Adam: A crime should be punished, not condoned. Amanda: If a woman commits it. She swings over and stops the car abruptly, angering a cab driver: "Oh you lady drivers, you'll put me away yet!" At his desk, Adam is chagrined and mumbles that he has been assigned to prosecute Doris Attinger for the attempted murder of her husband Warren: "The one case I don't want is the case I get." One of his assistants, Roy (David Clarke) assures him of an easy victory in an open-and-shut case: "It's a cinch. They already got you a full confession. That's the kind of case you take your knitting. A cinch." Amanda: What do you think of a man who is unfaithful to his wife? Amanda: All right, now what about a woman who is unfaithful to her husband? Amanda: Why the difference? Why the difference? Why 'not nice' if he does it and 'something terrible' if she does it? Grace: I don't make the rules. Amanda: Sure you do. We all do....A boy sows a wild oat or two, the whole world winks. A girl does the same - scandal. Adam phones, telling Amanda that he has been "elected" by his chief to prosecute "the woman who shot her husband yesterday" - and "the boss wants a quick conviction, and I'm just the little guy that can get it for him, so he says." However, Amanda is outraged: "You great big he-men make me sick...An outrage, that's what I think." She hangs up when Adam infuriates her even further by laughing and remarking: "You just sound cute when you get cause-y." Because she feels that was "the straw that broke the camel's back...the last straw on a female camel," Amanda decides to take on Doris' defense - she rushes to volunteer her services with a request to call Legal Aid to take the case. Beryl: Murderers running around. What kind of a town is this? Adam: We don't have so many murderers running around, Miss, uh, but we have a lot of other things just as bad. Beryl: You mean like me, huh? Listen, bub, I connect with ya - ya ain't over my head. Adam promises Warren to "get a conviction on an attempted murder, or first-degree assault..."
Doris: No accident. I wanted to shoot him. Amanda: Suppose we decide later just what you wanted to do. Amanda: The difference between ten years in prison and freedom is not silly, Mrs. Attinger. Doris: ...I went outside of his office and I waited the whole afternoon and I kept eatin' the candy bars and waitin' until he come out. And then I followed him, and then I shot him. Amanda: And after you shot him, how did you feel then?